Oats are one of my favourite breakfast options, but as it gets warmer porridge becomes slightly less appealing and I’m always ready for a change in options. I’ve been trialling a couple of new UNCLE TOBYS oat products and these have been the base of my overnight oat recipes. UNCLE TOBYS Ancient Grains Oats is oats with a bit of a twist. It also contains rye, millet and quinoa which makes a tasty change to original oats as well as adding a bit of a different nutritional profile. 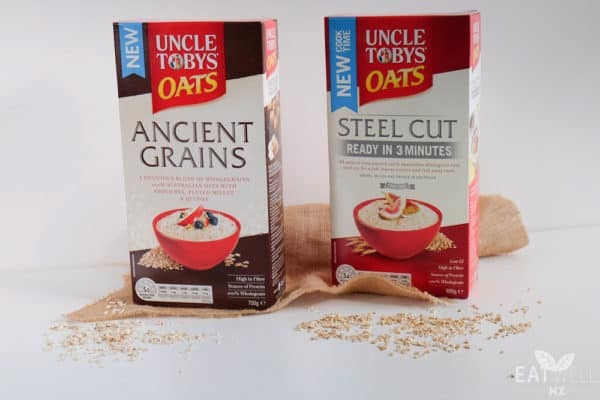 I’ve also been using UNCLE TOBYS Steel Cut oats. Instead of being rolled flat after the husk is removed like rolled oats, steel cut oats are oven toasted then cut into pieces using steel discs – hence their name! They have a nutty taste, a hearty texture and have a low glycemic index to give you a nice slow release of energy. A good breakfast is one way to be on the path to wellness, but there are lots of other ways too. If you want some tips on how you can improve your wellness, thanks to Nestlé you can take a quiz here and get your own wellness score plus tips on how you can improve your wellbeing. 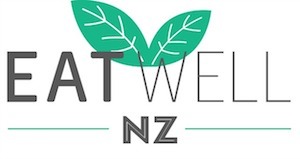 The quiz looks at an overall picture of wellness and will give you your results and some relevant tips around happiness, sleep, alcohol, exercise, healthy eating etc. It does talk about weight which is something I don’t tend to focus on, but there are lots of useful tips for healthy eating and building healthy habits. And in the meantime, here’s my two delicious, nourishing recipes for some new breakfast inspiration. Place the oats, chia seeds, milk, ¼ of the cup of the blueberries and ¼ cup of the yoghurt in a bowl and mix together. Place in the fridge and leave overnight. In the morning, cut the banana in half and mash. Stir through the oats. Spoon half the oats into a glass, then add the rest of the yoghurt, then the rest of the oats. Top with the remaining half of the banana cut into slices and the remaining blueberries. Tip: If you prefer things a little sweeter, stir through a teaspoon of maple syrup through the oats. In a small bowl, mix together the steel cut oats, milk, coconut milk, ¼ cup yoghurt and the coconut threads. Place in the fridge overnight. In the morning, top with passionfruit pulp, raspberries and remaining yoghurt and add an extra sprinkle of coconut threads. Open to NZ residents only. Competition closes Friday 14th October. Blueberries, chia seeds, yoghurt and banana is my fave! I juar love oats as a porridge with blueberries and/or banana and a little honey. I also like making my own meusli although I haven’t done that for a while. Must get back into making it. I love to eat oats naturally with blue berries or banana with milk and cinnamon. Whole grain Oates, blueberries, banana, chai seeds, LSA soaked over night in water then add yogurt in the morning is our favourite for myself and little Miss Two! Love these with almond milk and a naughty swirl of maple syrup in winter. Am inspired by the above recipes absolutely I would love to make this! Yum! Apple, chia seeds , cinnamon yoghurt oats and almond milk. My fav!! Oats cooked with honey, chia seeds and mashed ripe banana. Then topped with dates, freeze dried blueberries,mcooked apple, butter, granulated sugar, and sprinkle of pure delish. Yum! ???? Strawberry and kiwifruit is a favorite combo of mine. I think after reading above that I would like to try adding coconut to it too. Thanks for telling us about uncle Toby’s I didn’t know they made overnight oats. Hot Porridge with Nutella stirred through with a splash of cream yummo ! I’ve only just started having overnight oats, I’m pretty lazy though so I just have oats + milk + cranberries + LSA. Previously I had hot porridge but I actually prefer it cold! Chia seeds with unsweetened almond milk. Blueberries when in season. I like oats with yoghurt, stewed apple, coconut flakes and some LSA for breakfast. Yum! Keen to try the Ancient grains oats. At the moment it’s just porridge with fruit for me but I like these recipes. I’m going to try the Passionfruit, coconut and raspberry overnight oats as I’ve got most of those ingredients already! I love the look of the passion fruit, coconut and raspberry overnight oats! I love using them in my own homemade toasted muesli that I make full of oats, nuts and coconut so yum with yoghurt and blueberries in the morning! I don’t have a favourite way to eat oats, it just depends on my mood! Sometimes it’s good old porridge heated through with full cream milk and a bit of banana and a few dates, other times I like overnight soaked oats soaked in coconut cream with blueberries… Can’t beat oats! Enjoy my oats the traditional way with warm milk, like to add some sultanas and chopped dates so good to full the stomach to start the day. My daughter (22 months) and I like porridge with banana and almonds. Or oaty raisin and cinnamon cookies! Oats cooked with mashed banana, nut butter, chia seeds and almond milk- yum! I just love to add rolled oats as they are to coconut yoghurt, mix until combined, and eat ???? Cooked with blueberries mixed through. Love to put oats into baking. Adding texture and fibre, lowering GI. Apple cinnamon porridge! Tastes like stewed apple! Can’t beat a good comforting fruit crumble ???????? I’m really into using wholegrain oats in my morning smoothie to increase fibre content and keep me fuller for longer! I always cook my oats in the microwave with water, not milk. I used to just slice up a banana and mix that in when the oats were ready, but lately I’ve been mixing in some protein powder prior to cooking and it’s pretty tasty! I love Bircher muesli in warmer weather so looking forward to trying your banana version. I love porridge oats topped with natural yoghurt, berries & coconut thread! A great warm breakfast on a cold morning! Always put oats in our smoothies. Especially for the kids! I LOVE oats! In the winter I have them with water, berries and a bit of maple syrup. In summer I make overnight oats with natural yogurt, sometimes protein powder and berries. I made overnight oats once with water, oats, white chocolate protein and raspberries – white chocolate Raspberry protein oats! Delicious! I use oats in vegetarian sausage rolls! Amazing! Also add to meatballs and have them most mornings with greek yoghurt and fruit! Hot mixed with peanut butter and banana mmmm yummy! ???? I find my porridge blends so much better if I add chia seeds.. and then on top I add yoghurt and sliced banana with a mix of pumpkin seeds, cashews, flax seed and cranberries! Its so yummy, and I love the added nutrients from the grains! I love porridge on a cold day, yummm! Homemade museum is my favourite but I will be trying these two recipes – they both sound tasty! With yoghurt and chocolate protein powder – tastes like pudding! I love to cook cherries with chia seeds to thicken, then add a dollop onto my hot porridge and some thick Greek yoghurt – so delicious! Toasted with honey in homemade Museli! I love mixing oats with grated apple, yogurt and cinnamon, then soaking it apple juice overnight. I love eating oats with banana. Yum!!!! I’m a huge oats fan and these two recipes sound delicious. I’m giving them a go right away. Thanks Uncle Yoby! Oats, banana flavoured protein powder, almond milk, chia seeds, sunflower seeds and almonds zapped in the microwave for 2mins ???? I had oats to my fav smoothie….. Unsweetened almond milk, oats, banana, peanut or almond butter, cacao powder and sometimes a natural choc protein powder if before or after a workout. Yum!! Hot or cold oats are great. I love adding dried fruit for a sweet treat and fruit in season or frozen berries. A bit of cinnamon with Apple is a great combination too. Overnight oats with chia seeds, raspberries and blueberries is delish! Going to try adding coconut threads now for an extra texture yum! I have a fantastic muffin recipe using oats and yoghurt… Very moreish and the kids love them too! I love porridge in the winter with blueberries, almonds, pumpkin seeds and coconut. I love my morning porridge. Love the sound of both these. Filing them away for summer. I bake them on seasonal fruit and have fruit crumble with yoghurt for breakfast. I like oats the traditional way – made with milk in the microwave with a pinch of salt. I used to liberally sprinkle brown sugar but now I top it with in-season stewed fruit and Greek yoghurt. My fav weekday breakfast. Love feijoas so froze heaps last season so my favourite is oats, sunflower seeds, and frozen feijoa soaked overnight and yogurt and a blob of black currant jam or lemon honey in the morning. I love my oats with Apple, banana and cinnamon. Topped with a little bit of sugar of course! Either as porridge, or made into a topping for apple crumble. Yum! I whisk half a cup of oats with a couple of egg whites, a whole egg, some cinnamon and lsa and dry fry it like a pancake. Top with Greek yogurt, more Cinnamon and blueberries. So good, and keeps you full for hours! Porridge with banana but would like to try something different like this ???? I love oats in so many forms! I have overnight oats for breakfast most days (with almond milk, vanilla protein powder, cacao powder, Chia seeds, flaxseed, PB, half a banana and yoghurt) and I also love to use blended oats instead of flour in lots of baking recipes (perfect for muffins, slices etc!) Would be great to try this new range! I just love oats in general. Hot in the winter and overnight oats in the summer. So good! I’ve only eaten oats as porridge so I’m excited to try your banana berry recepie!! Need a healthy, alternate beakfast for summer! ???? I use loads of oats in my baking, whether it be cookies (can’t go wrong with a classic oat and raisin cookie), slice (I’ve got a fabulous recipe for Anzac slice with a layer of homemade feijoa jam in the middle) or muffins (banana, oat and choc chip is always a winner). My husband and daughter really enjoy porridge with sliced banana and a bit of local honey stirred in, but I’d rather have some homemade granola. This is my go to breakfast every morning!! Even on my birthday. Its my fav food ever!! I love having PROATS after my workout in the morning. A packet of oats cooked for 90 seconds then let cool and add protein powder! Adds flavour and is so good for you! At the moment I’m loving oats cooked with chia seeds and a grated apple, I then stir maple syrup and almond butter through and tip with yoghurt and almonds. So yum and so filling! I think my fav is gonna be the blueberry and banana when I try it ???? Always love a classic porridge, with nuts and yoghurt – or cream if I’m feeling particularly extravagant. I’m loving the easy option of throwing oats into my morning smoothie, now the days are warmer. So easy and nourishing. i love both rolled oats and steel cut oats. In a berry smoothie or toasted with nuts as a cereal! Yummy! Traditional Porridge made with soy milk, with LSA sprinkled on top and soy milk and banana. Definitely w peanut butter, dates, melted squares of dark chocolate, shredded coconut and soy milk! Eating some this moment, in fact! I add oats to my smoothies, they help keep me more full for longer. Also nice cos they help thicken up my smoothies too! 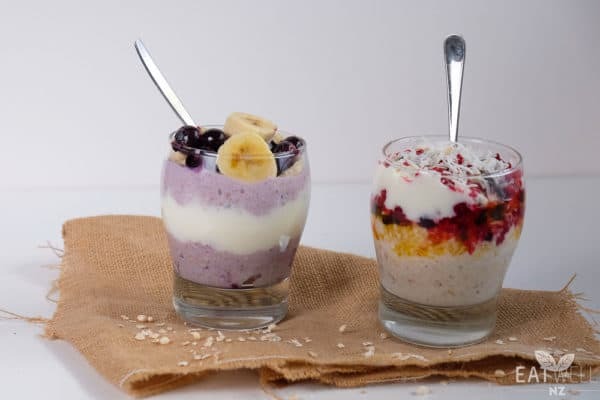 I’m yet to try overnight oats, these recipes sound delicious! 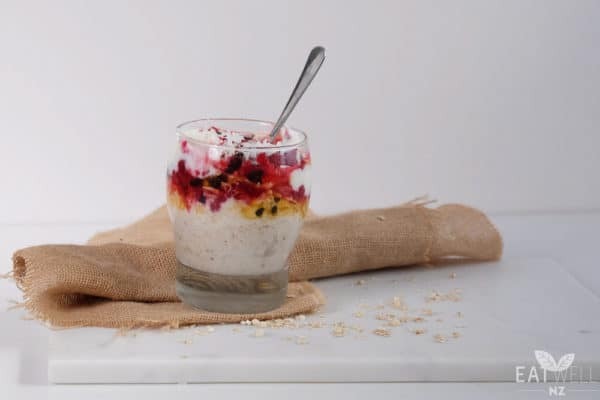 I love overnight oats too…in winter I warm up in the microwave before adding my yoghurt. I love overnight oats they are super versatile and easy to mix up!! I love to cook my oats up in a pot and stir through grated carrot, sultanas, cinnamon, maple syrup and walnuts – it’s like carrot cake porridge!!! My favourite at the moment is 1/2 of oats 1/2 of almond milk a mashed banana and a teaspoon of peanut butter sometimes I add a bit of Greek or vanilla yogurt too! 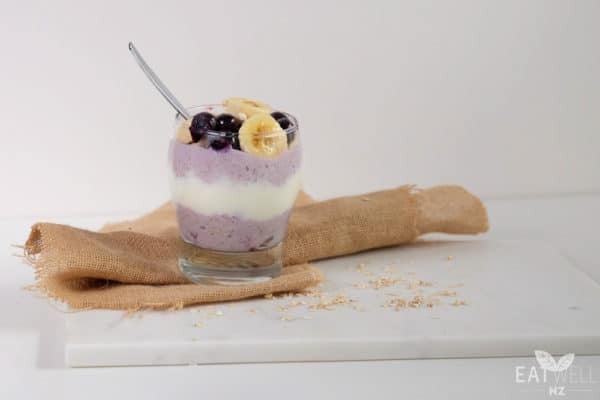 The Overnight Oats concept is a great one for Summer Breakfast & Brunch! I’m going to try it as my own ‘Humming Bird’ variation: (Pineapple; Banana; Coconut & Brown Sugar). Also I can visualise it working well as a ‘Peach Melba’ creation: Just imagine it, with fresh raspberries & luscious peaches topped with a dollop of yoghurt! Passionfruit raspberry and coconut looks great to me. Just good old fashioned porridge – but made with oat milk! And cinnamon! So yum! Hot oats with cinnamon but I’d love to try cold passionfruit raspberry ???? We love warm oats with cinnamon, walnuts and banana. Will have to try the overnight oats recipes too! Warm with almond milk, cinnamon and banana. Then topped with blueberries, more banana and sprinkled with some nuts. My favourite! We have been experimenting with different ways to eat oats still love oats with brown sugar and cream but these recipes look like they are going to be on my list for sure! Im in love with the brown sugar and cinnamon porridge from uncle tobys atm, so thats the favourite for now. Anzac Biscuits. I really need to find healthier alternatives. I blitz oats, apple and an egg, then make amazing little apple oat hotcakes with them in a non-stick pan! I have written out the full recipe for myself. I’ve recently discovered cottage cheese and porridge is yummy. But apple or bananas, LSA and cinnamon is my staple during Winter. I love oats on top of baked apple! So yummy ! These sound yummy, I’m going to try them. I love a homemade Apple Crumble. Main ingredient – Oats ! with sliced almonds, sunflower seeds, and coconut thread. My favorite or go to overnight oats would have to be leaving oats, chia seeds and other nuts (almonds/cashews) over night in the fridge and in the morning adding a blend of cinnamon, bananna, almond milk. My breakfast smoothie is a yummy mix of half a banana and half an apple or some mixed berries with either spinach or kale or beetroot, with a spoonful of chia seeds, and a spoonful of LSA powder, and 3 spoons of oats, blended together with coconut water and sometimes even a scoop of plain yoghurt… a perfect start to my day! !